Here is our collection of best truth or dare questions for married couples. You may try these questions when you are playing truth or dare game with your husband or wife. 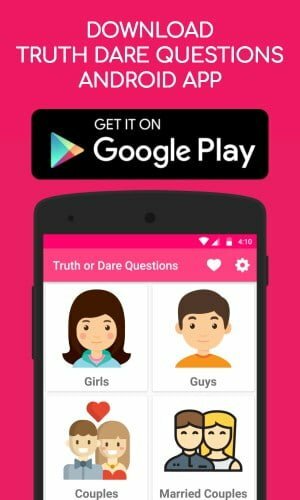 Enjoy this list of truth or dare questions for married couples and have fun with your partner. Tell me about your biggest worry? Did you even catch telling a lie? If yes, when and what is the lie? Have you ever fallen down in public? If yes describe the situation in detail. What is your biggest fear that no one would believe? Do you like my parents? From this group, who do you feel is a perfect couple? Why? What is the dumbest thing you have ever said to your partner? What is your primary goal when you are about to retire? If you had to choose to wear a shirt for lifetime, which one do you pick? Do you remember my weighr when we get married? Have you ever shouted someone’s name instead of the person’s name you are with? Hope you like our list of best truth questions for married couples. If you know any other truth questions for married couples, let us know in the comment section below. Send your photo without any makeup to your wife/husband. Don’t see and talk with your wife/husband for 10 days. Brush your wife/husband’s teeth for one week. Stand on one leg for 2 minutes in front of your family members. Place some butter on your elbow and try to eat it with your tongue. Show me how you feel when I say leave me alone. Hope you like our list of best truth or dare questions for married couples. If you know any other truth or dare questions for married couples then please let us know in the comment section below.